The TLM 103 is the ideal large diaphragm microphone for all professional and semi-professional applications requiring the utmost in sound quality on a limited budget. 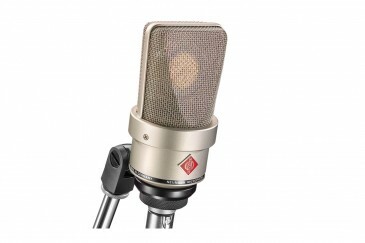 By utilizing the tried and true transformerless circuit found in numerous Neumann microphones, the TLM 103 features yet unattained low self-noise and the highest sound pressure level transmission. The capsule, derived from that used in the U 87, has a cardioid pattern, is acoustically well-balanced and provides extraordinary attenuation of signals from the rear. - Extremely low noise: 7 dB-A. - Straightforward handling for homerecording and professional studios. - High-quality professional equipment for limited budgets.